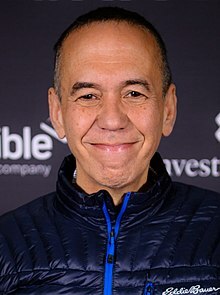 Gilbert Gottfried (born Februar 28, 1955) is an American staund-up comedian, actor, vyce actor an comedian. His numerous roles in film an televeesion include voicin the parrot Iago in Disney's Aladdin, Deegit in the bairns' cartoon/eddicational math-based shaw Cyberchase an Kraang Subprime in Teenage Mutant Ninja Turtles. Gottfried wis an aa the vyce o the Aflac Duck till 2011. ↑ 1.0 1.1 "Gilbert Gottfried. New York Times".